One of the reasons Amazon stopped resisting the sales-tax collection from the various states is because they had a variety of plans for local delivery and sales of products. One such thing is their “Treasure Truck”. 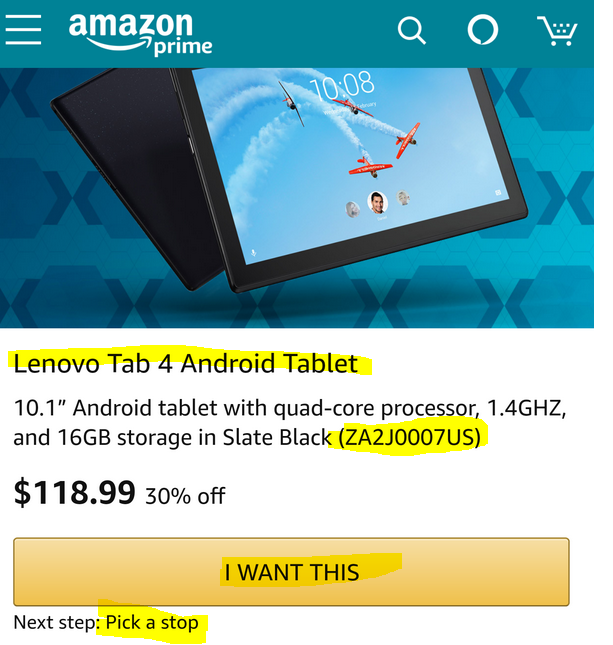 Amazon’s “truck” (virtual or actual) shows up at predetermined locations and offers a particular product at a particular price. Happening now at a various locations around the country is the new condition 10-inch Lenovo Tab 4 Android, model ZA2J0007US, offered for $120 with free pickup from the Treasure Truck. The price of this at the Amazon website (where it averages 4.2 out of 5 based on nearly 300 customer reviews) is $170. The tablet itself’s standout feature is a 20 hour battery life estimate, with 2GB RAM, Snapdragon processor, 1280 x 800 resolution, microSD, Android 7.1 and such. A lot of the laptops featured on sale typically have non-Core processors, or if they have one of the Core processors, they are typically i3 or i5. But if you are fond of the i7s, the current spotlight deal at the eBay Deals is the new condition 15.6-inch Lenovo G50 (model 59421808) for $540 with free shipping. This is sold by NewEgg’s eBay store, so it’s a trustworthy seller. Over 1950 laptops got sold from this eBay listing so far. The limit is five per customer and NewEgg is strict about the limit. So what does $550 get you? The Intel Core i7-4510U 2.0GHz processor which currently ranks #431 at cpubenchmark.net. You get 8GB of RAM (which is the maximum supported) and 1TB of hard disk, and DVD burner, and Intel HD Graphics 4400, 4-cell battery and 4.63 lbs weight. You can’t expect miracles at this price, the resolution is 1366 x 768, and not a touchscreen. On the connection front, there’s Bluetooth 4.0, HDMI, VGA, one USB 3.0 and two USB 2s, card reader, 10/100 Ethernet, and things like that. This is a Windows 8.1 laptop.